How to tell if a traditional is good quality and worth saving? Discussion in 'Traditional Folders and Fixed Blades' started by cbrstar, Mar 20, 2019. I go to a lot of pawnshops, flea markets, and antique stores. I must have come across thousands of traditionals over the years yet I've never really bought any. I think the problem is I don't really know what to look for? What are some of the features you need to look for on a quality knife compared to the run of the mill? I imagine you can't go by names as many have come and gone and the history is hard to obtain. cigarrodog and Old Engineer like this. I would suggest that you read and follow the " Old Knives " thread that is above in the Yellow area . Thank you for pointing out that thread for me. I will try to go through it and learn what I can. The knives i found exploring as a child in the garage in folgers cans full of old screws, in ammo cans, in dads squirrel/rabbit vest with blades froze, missing shields, nail nicks too shallow to gain purchase, cheap lock backs from overseas. All these I avoid as an adult. JohnDF, meako and cbrstar like this. You will get a super education just by absorbing all that you read here in the Traditionals. I was a beginner here and remain a beginner. There’s so much to take in. So many knowledgeable members here. One example is my knowing next to nothing about Schrade knives. Just by slowly reading the information and by seeing the images, I am starting(barely ) to get a handle on what I truely want to collect. If I can become educated, anyone, with some effort, can. Best wishes on your journey. Ace Rimmer and cbrstar like this. JohnDF, Eli Chaps, Edgeoflife and 1 other person like this. I guess it helps to find a brand and go from there. Otherwise there's probably too much info out there to absorb. That's what happened with this one. I was at the antique store and they had a tray of about 20 knives but this is the only one that opened and closed relatively easy so I bought it on a whim. But I'm the kind of person who hates seeing things go to waste so I was hoping there was little tell tale signs of what to look for. But I understand what you are saying, it's better if the knife speaks to your heart. cigarrodog, meako, TheFactor and 1 other person like this. For sure there is technical things to look for as a guide in the right direction. But the core is what is says to your heart no doubt . cigarrodog and cbrstar like this. The list can be long as far as what to look for . But blade centering with preferably no blade rub,The blade pull being what you like between hard and light ,walk and talk meaning that nice snap when opening and closing , nicely nestled in pins somewhat matching on both sides and the covers matching if that’s your personal preference with no cracks around the pins . Preferably no gaps on the back spring . The list can go on but those are a good base to start with . cigarrodog, cbrstar and JohnDF like this. The best I can tell you is that if it doesn't appear broken and is pretty cheap I'd buy it. If you can make out any markings and see JAPAN, CHINA, HONG KONG, TAIWAN, or PAKISTAN I'd generally stay away unless it's extremely cheap and you really like it for some reason. I say Just keep an eye out for something that appeals to you that's in a condition you're comfortable with for the money. I also shop flea markets and antique shops regularly. Overtime I have purchased some knives that may not have been worth the price, and others that were a steal. You just have to jump in and buy a few knives and do a bit of research. Eventually you get an idea of what an older knife looks and feels like, and after handling many you get a feel for quality. The hardest thing for me is finding knives with nice full-ish blades, or without significant rust. The vast majority of older slip joints I find are either very high price, or have half of the blade sharpened off. 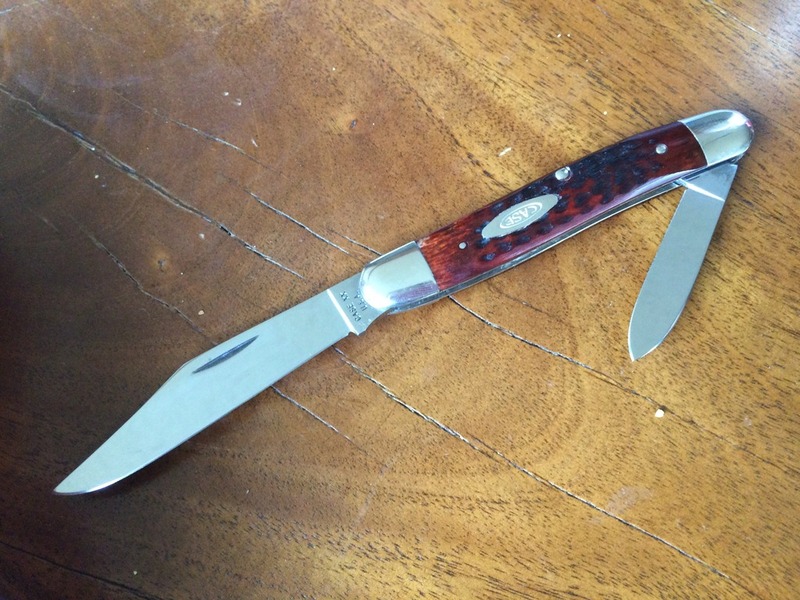 Finding an old knife that was treated well, yet not at collector prices is part of the hunt. Most people on the forums do not post how much they paid for certain knives, so market value can be hard to gauge. Just find a price range you are comfortable with and stay in that range. If a knife looks and feels good, and falls within your price range, then you can't really go wrong. You can watch the exchange in the traditional section and keep an eye out for older knives for average prices. Couple knives I bought that I am happy with. My personal price range goes up to about $40. Above that it needs to be special in some way. r8shell, cbrstar, Misplaced Hillbilly and 4 others like this. 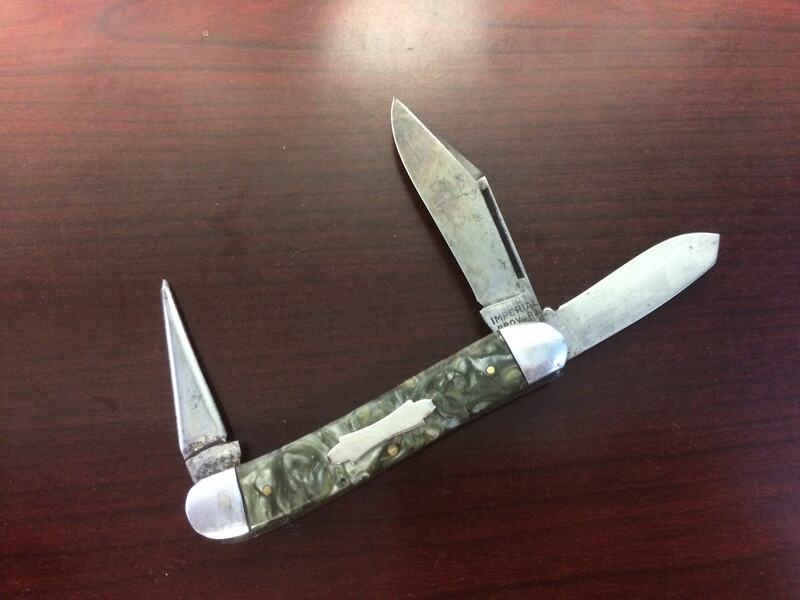 Conchita came home from a visit with her mother carrying an old camp knife. It was typically grungy, and the joints were kind of creaky. The brand was Sabre, made in Japan. I flushed yhe joints and lubed it for her. It was obviously an inexpensive knife, not bad but it did not exactly scream high quality. She had already looked it up, and knew it was nothing special, except that it had belonged to her grandfather, which meant everything. Misplaced Hillbilly, zolthar, cigarrodog and 1 other person like this. 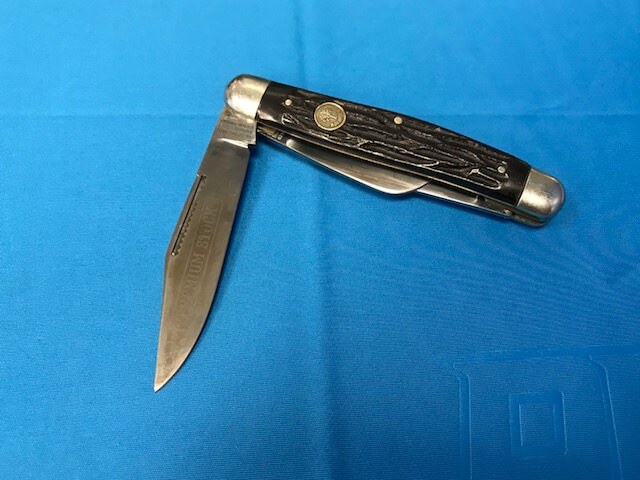 Don't give up on pawn shops and antique shops, I have a 5 blade Case stockman that I've found examples of online going between $325-390, I gave $50 at a pawn shop. It's pretty much my only "safe queen"lol. Also I've looked at knives one weekend, came here and searched the make and such. Then once I have more information I went back and bought them. I say most of my growing collection has come from antique and pawn shops.